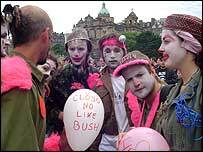 A Carnival for Full Enjoyment was what demonstrators said they wanted to hold in Edinburgh on Monday. However a short march, which started with plenty of colour, samba drums and whistles in the west end of the city, soon turned into a day-long game of cat and mouse. Many protesters focused on fun but those seeking to cause disorder laid down the gauntlet to police officers who were determined to keep control. It was to be a day of general protest against the establishment, with a particular focus on capitalism and "wage slavery history". As I went out to cover the event I was reminded of the famous quip from Marlon Brando in the movie The Wild One. When asked what he was rebelling against, he replied: "Whaddya got?". Following the two sides around the capital's streets on Monday were excitable members of the media. Much of Edinburgh itself was already prepared, with many shops having shut for the day, their doors and windows boarded over. Those retailers who did open on the main shopping thoroughfare of Princes Street had private security men in place to keep a close watch on entrances. The demonstrators were supposed to rally at midday in the west of the city but while there were small groups none seemed more substantial than about 100 who started to congregate near Edinburgh's financial district. There may have been some relief among press photographers who had been deployed by anxious editors hours earlier. A colourful and noisy march was managed by police who used officers on foot along with police horses to slowly move the swelling band down Shandwick Place and into a small backstreet at Canning Street Lane. A lot of these protesters were dressed in clown outfits and carried musical instruments and whistles. Many of those taking part were from other European countries and were in their late teens. With high buildings on either side, police officers formed human walls at each end, trapping the protesters and stopping their movement. The officers moved slowly, with arms down but deliberately fixing their gaze, on the lookout for any potential trouble. 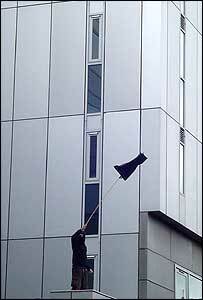 One anarchist managed to climb onto the roof of an annex building and egged on the crowd. He threatened to urinate over the police but instead resorted to dropping his trousers and showing his behind. Among the hundreds being held, despite the odd skirmish, were a small group of masked individuals dressed in black who had clearly come to show a more aggressive face of anti-G8 protest. Slogans spray painted by them on building walls ranged from "make your voice heard" to "smash kapital". The group was eventually allowed to disperse one by one through the wall of police, but only after submitting to bag searches and agreeing to have their photographs taken. As they moved on, officers were soon called to respond in numbers to a protest in the middle of Princes Street. Trouble flared when a separate impromptu march of hundreds spilled onto the main road and what had been a peaceful demonstration turned into an ugly confrontation near the Scott Monument. Protesters blowing whistles stood on top of bus stops while others flying black flags jeered at police. A secondary wave of demonstrators trying to join those on Princes Street were corralled by officers in riot gear into Princes Street gardens where missiles were thrown and arrests were made. 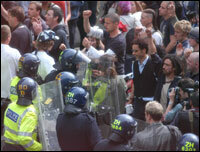 As various small stand-offs continued, protesters looked visibly more organised. Police later confirmed that the anarchists were found to be carrying maps, two-way radios and mobile phones. Shops which had promised to remain open quickly shut their doors as trouble flared, in many cases locking startled shoppers and tourists inside. A family of American visitors to Scotland's capital said they had no idea what was going on after arriving from the airport at the height of the trouble. One said: "We came out for a look round but we'll be staying inside our hotel until it's safe to come out. We've only just arrived and don't even know what's going on." Monday's "carnival" was the third event in as many days in the capital, coming after the Make Poverty History march on Saturday and a smaller Stop the War demonstration on Sunday. One Edinburgh resident told BBC Scotland's news website that she was angry protesters had stopped local people going about their daily business in the city. She said: "I marched with my family on Saturday for Make Poverty History, but what is today supposed to be about? I don't know anything about these demonstrators, or what they are hoping to achieve. "It seems like a complete waste of time as far as I'm concerned and to be honest they are nothing more than a pest. "If this is G8-related, the sooner it is all over the better. Scenes like these are the last thing ordinary people want to have to face in their home town."